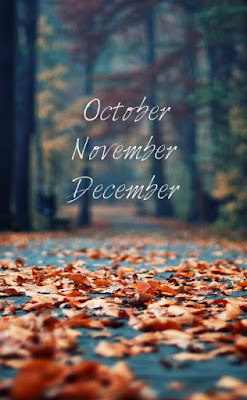 These are my favorite months of the year. I love the brisk chill in the air that makes pink on your cheeks. I love the trees turning red and looking like fire against the blue sky. I love the wind swooping through and causing the leaves that have fallen to scitter around on the sidewalk before you. I love the feeling of clutching a hot drink in cold hands. I love cold weather fashion - getting out the flannels, boots, and jeans, and gearing up to layer. I love bustling around the kitchen all day making Thanksgiving dinner, chopping celery and stirring sausage and baking buttermilk biscuits. I love the sound of 1940s Christmas music drifting from the radio. I love getting out the glittery tinsel of red and silver and green. I love watching the bare brown branches of the trees being covered slowly in white. I love the cold smell of snow in the air. I love curling up in front of a golden fire and watching the snow fall outside. I love fall fashions: fake uggs, big sweaters and LOTS of layers. I love Christmas music. For my performing company we have a few Christmas numbers, so when you walk into the studio, you can hear Christmas music playing. I love watching snow fall. BOOTS BOOTS BOOTS BOOTS BOOTS BOOTS BOOTS. Big sweaters and layering are almost as awesome. ChRiStMaS mUsIc Is So AwEsOmE. Ooooh, that sounds absolutely divine. OCTOBER, NOVEMBER, AND DECEMBER ARE THE BEST MONTHS OF THE YEAR. IM SO HAPPY THEY'RE FINALLY HERE. IKR I'VE BEEN WAITING SO SO LONG. I like drinking tea and the fact that it isn't so hot outside. I don't like that I have a cold right now and that my nose is always freezing. SAME SAME SAME. Tea is just so delicious and it fills your insides all the way up with cozy warmth and relaxation. I HAVE ALREADY BAKED A BATCH OF PUMPKIN MUFFINS AND WATCHED PART OF ELF TODAY. NOT TO MENTION IT'S RAINING, EVERYTHING OUTSIDE LOOKS GORGEOUS, AND IT'S ARGUABLY ONE OF THE BEST MONTHS OF THE YEAR. I LOVE RAIN AND IKR IT IS. You will be happy to know that I reread some chapters of Night Watch and now have a slightly firmer grasp on who Vetinari Havelock is. I think. My dinosaur brain has an awful time paying attention so I have only a dim idea of what's going on besides the main character. This is probably a bad sign for school. Vetinari Havelock might not even be his name. We'll call him AssassinV. • he was reading a fancy book on concealment that no longer exists. • someone threw fruit at him, and he stabbed it out of mid air. • he and madam were in a coach with a gastrointestinally excited cat, possibly plotting to kill Vimes??? My dinosaur brain won't let me remember any more. Except for Seamstresses. Either this is a cult of more assassins, but female, or a group of women who engage in licentious behavior. I'm concerned that my reading love is dropping because I read the book, but only halfway know what's going on. Help me, Ellie the reading comprehension savior! It's Havelock Vetinari. But you were close. These books can be pretty hard to understand at times. But yes, as far as I remember (and keep in mind I last read this about a year ago), Madam is actually Vetinari's aunt, and it's she who made him go to Assassin School. She does want to kill Vimes (or someone), and the Seamstresses are very licentious. The premise of the book is that Vimes was chasing a serial killer, but they were both transported back in time to when Vimes and Vetinari were boys. There was a street revolution going on in Ankh-Morpork at that time, and full-grown Vimes joins up in the Watch under an assumed name to try to help. Meanwhile, the aristocracy is plotting to kill either the Patrician at the time (not Vetinari, either his predecessor or his predecessor's predecessor) or Vimes, and young Vetinari, as the nephew of one of the main plotters and Assassin's Guild prodigy, is smack in the middle of that. And meanwhile, Carcer, the serial killer, is still on the loose. I HOPE I HAVE HELPED YOUNG BLOOD. THANK YOU YES IT DID. your summaries are great for my dinosaur brain. Which reminds me- how's the Silmarillion coming? FUNNY YOU SHOULD ASK THAT I WAS LITERALLY IN THE MIDDLE OF TYPING IT UP I SAW YOUR COMMENT. I've completed part 4 and am working on part 5, so you can expect at least those two in the near future (actually, 4 will probably make its appearance on Monday or Wednesday if not before, and 5 soon after that). I AM SO SORRY FOR THE WAIT YOUNG BLOOD BUT THEY ARE COMING. YES IKR FALL/EARLY WINTER IS THE BEST! Christmas music is its own category of amazing. My mom really likes 1940s music though so I hear it in the car a lot. Every time frank Sinatra comes on it makes me wish they were playing Christmas songs already. Fall and winter are just so great. So is summer. And spring. You know the weather is just wonderful. Ugh LUCKY my parents forbid holiday songs until after Thanksgiving. *Is that a WTNV thing? Hot drinks in cold hands is one of the best feelings ever. I love working at a coffee shop where I can make warm drinks for customers! IKR! I've never worked at a coffee shop, but I sure love going to them. SOUNDS SO BEAUTIFUL I'M EXCITED TOO YOUR EXCITE HAS MADE ME EVEN MORE EXCITE.